Torbet Law, a law firm based in Colorado Springs, contacted us in early 2014 with a problem–their existing website was going to be taken down and they needed a replacement before that date. Torbet already knew they wanted a new website, and they didn’t want to go through the hassle of transferring the existing website to a new server, and then the additional hassle of creating a new website. Better to get a new website designed, then simply let the old one disappear. Hi Hans, we’re glad to be getting started working with you on the redesign for your website. I don’t want to step on any toes or offend any sensibilities, but I would like to pitch you on going in a different direction on the design of your website. It’s not that the one you’ve had is bad, but there are a few design trends that have been emerging over the past 1-2 years, and I believe these are not just fads, but the future. I want to make sure your new site is at the forefront of great design, rather than outdated the moment we launch it. These design trends are also helpful when it comes to online marketing. The two trends are responsive design, and flat design. We have a post on our blog which goes into a bit more depth as to why these two design trends are helpful for your online marketing. To summarize it all in a nutshell, using these two design trends results in users having a better experience on your website, which makes them stick around longer, which sends signals to Google that your site is more credible, and results in better rankings in the search engines. And of course if users have a better experience on your website they’re more likely to want to hire you. 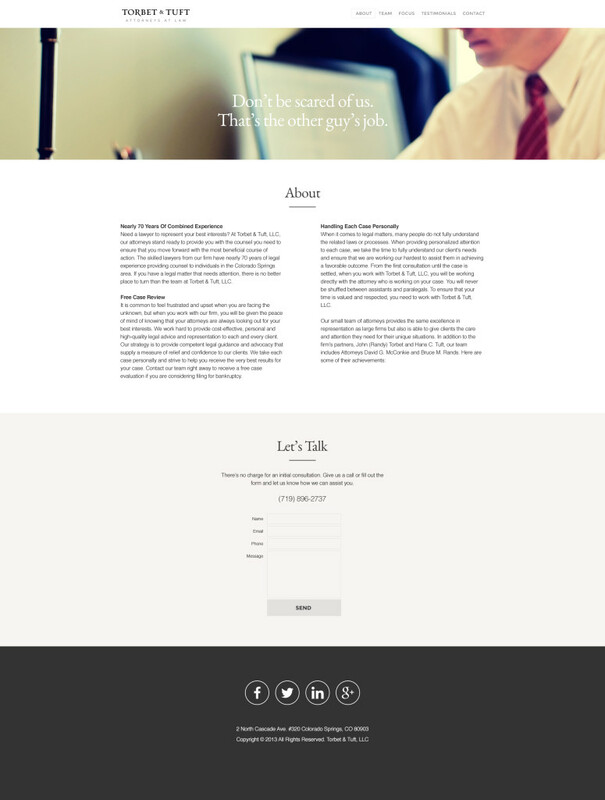 Here are some examples of law firm websites (not designed by us) to further demonstrate what I’m talking about. These websites are responsive, but not flat. These websites are flat, but not responsive. These websites are both flat, and responsive. Of all these websites, the Pace Law website probably combines the use of flat and responsive design the best. I understand if the colors, photos, and certain design elements aren’t your style, but these are only part of the design. What I would like to do is have our team create a homepage using the latest flat and responsive design techniques for you to review. If you don’t like it, that’s fine, we can create something more along the lines of the design you already have that you’ve said you like. But I’d like to give it a try and see if we can get the best of both worlds. Does that sound ok to you? Hi Hans, here’s a first stab at a new design for the site. The fonts aren’t a perfect match to the logo, but once I know what those are we can match them just right. Let me walk you through the thinking on the rest of it. 1. Photos – If there are any other large photos you can send me that we might be able to plug in at the top let me know. The only difference between the two attachments is that the photo at the top is different. None of the others quite works. I think we can make one of the two that are in there work, but it would be nice to have other options. I know the norm is to show the whole team at the top of law firm websites. Every partner wants to be shown up top, right? But because this is what all law firm websites do it has become cliche. Having the photo of just Randy there immediately tells people this website is different. 2. Icons – These are placeholders. I have another designer who will work on some icons that are more directly relevant and better looking. But you get the idea. 3. As I proposed in my other message, this website utilizes flat design and would be responsive to fit everything from desktop sites to smartphones. It will look large on your desktop, but it will look beautiful when finished. I like this design and I’d be proud to have it in our portfolio. I hope you like it too, but please feel free to be frank in your thoughts. As it turned out, the fonts the designer had used for the logo were a bit expensive, but the larger issue was that we wanted to use web fonts, and these had annual licensing attached to them, which we knew would end up being a headache for the client to maintain, and worse if we had to maintain it for them. Thankfully we were able to find some free Google web fonts that did the trick. Torbet approved the designs and we started coding. We created responsive versions of the homepage and second-tier pages, and integrated everything with WordPress for content management. The final website did turn out different in some respects than the concepts. While in the design we included two-column text on the second-tier pages, we found these awkward to read, and even worse to maintain, so we ditched the two columns in favor of a single column of body text. We also reworked treatment of the photos, did some copywriting to polish up the content on the site, and modified the icons under the “What We Do” area on the homepage. The website launched on time and we avoided the Torbet Law website going down. This website is about as straightforward as it gets and that, combined with a client who was easy to work with, allowed us to get the site done quickly and in good form.